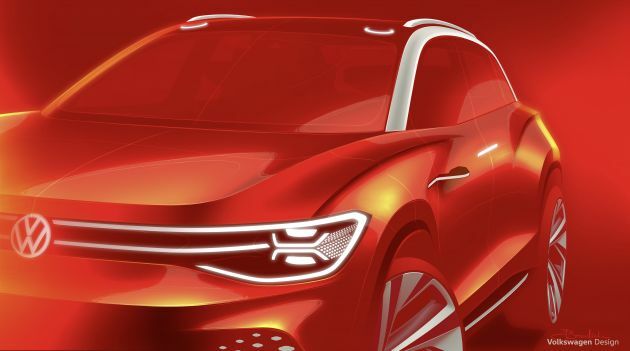 Volkswagen is heading to the 2019 Shanghai Motor Show with the sixth model from its I.D. family, the I.D. Roomzz. Like its stablemates, the I.D. Roomzz is based on the automaker’s MEB (modular electric drive matrix) platform for fully electric vehicles, and is the latest in line following the I.D., I.D. Crozz, I.D. Buzz, I.D. Vizzion and I.D. Buggy (not forgetting the I.D. R racer that has claimed the all-time Pikes Peak hillclimb record, with sights set on the Nordschleife next). A coach-door layout appears to be used for the SUV concept, with a front end similar to that of the I.D. Crozz. Inside, the I.D. Roomzz features ‘completely new seat configurations’ according to Volkswagen, which as its name suggests, aims to capitalise on the capaciousness of its cabin. This will also feature high-quality materials and customisable light, the German automaker adds. “The I.D. Roomzz shows us what we can expect from full-size electric SUVs in the future. The puristic look emphasizes the clear function and the user experience is intuitive and natural,” said Volkswagen chief designer Klaus Bischoff. As part of its model range DNA, the I.D. Roomzz will also feature an I.D. Pilot mode that enables level 4 autonomous driving – one which operates the vehicle without an active driver. For now, technical data on the I.D. Roomzz is scarce, though as a reference the more compact I.D. Hatchback concept is rated for a battery range of 550 km on the new WLTP test cycle. Meanwhile, the I.D. Crozz coupe/SUV crossover attains a range of 500 km from its 83 kWh battery, and gets going with a 102 PS/140 Nm front electric motor and a 204 PS/310 Nm rear motor for a 306 PS total. Crazy futuristic Game Changing design by VW! I hope Proton can come out with something like this but instead their designs are like Game Over cars. Luckily, we have Perodua that can design something outstanding and make Malaysians proud! Previous Post: SPIED: Audi Q8 plug-in hybrid seen – to debut soon?